The Messie Kitchen: Sweetbites Desserts-- Cupcakes Galore! Does this not make you smile? Look at this! Four cupcakes! You're all aware of the cupcake craze going on these days, and I am certainly on that bandwagon. To me, there is nothing better than bite size cakes, and with all the varieties, I could be satisfied for days. I am proud to admit that my Amie-boo is one of three bakers of these cups! It's true. All these months of cake baking have come to good use, and now she is an important employee of Sweetbites, a mobile cafe based in Washington, DC. Of course, major pub has been given to Georgetown Cupcake and surely Warren Brown's CakeLove is ever expanding, but now I've had all three, and I must say, Sweetbites is giving these bigger companies a run for their money. In addition to the fact that every morning Sweetbites bakes muffins, cookies, cheesecakes and of course these adorable cupcakes with the best of ingredients and no preservatives, but this on-the-move-truck was rated Best Food Truck in the 2010 issue of DC Magazine. My little Amie-- the best food truck! Oh and the menu just seems incredible. After my first sample of these cups, I can tell that quality matters and I can't wait to munch my way through the entire list. Sweetbites offers all nine of their cupcake flavors everyday.Want to know what they are? Prepare to drool a little. Triple European Chocolate, Cookies n' Cream, Chocolate Coconut, Red Velvet, Double Madagascar Vanilla, Madagascar Vanilla with Chocolate Buttercream, Pina Colada, Chocolate Peanut Butter and finally, Bittersweet Chocolate Ganache. Pictured here are four of the nine. I didn't have the chance to try the Madagascar Vanilla with Chocolate Buttercream but I can imagine it's a delight. If the frosting is anything like the French Chocolate, then this cup is a ten. How cute is that?! Who can resist that combination? Since I already had a chocolate cup, I only tried the frosting on this one. 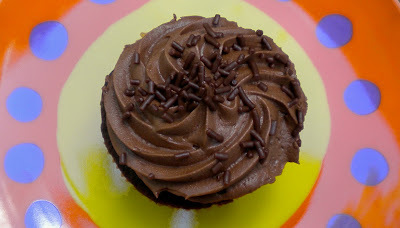 Like a light and airy peanut butter, the frosting was a wonderful complement to the dark chocolate cake. It's certainly a rich treat, and very sweet, but if you are a peanut butter fan, go here and order this immediately! So, I must be honest here. I'm a huge red velvet fan, but I'm so used to a cream cheese frosting. Sweetbites uses the vanilla buttercream frosting, and surprisingly, it was just fabulous. I'd love to see this cup with the cream cheese frosting, but it's a nice change up. You can easily go wrong with red velvet, and this little guy is oh so right. Oh baby. You know I love me some chocolate, and this rich cake did not disappoint--not a bit. The cake was cocoa-y and light but the frosting... ohhh the French Chocolate frosting. It was rich. It was creamy. It had a smooth and silky texture and it complemented the cake beautifully. In my opinion, if you can make a perfect chocolate on chocolate, then you're in business. This classic is just totally over the top. Wouldn't you like to have a cake walk like this?! These cups were truly fabulous, and I'm sure I'm not the first to toot their horn. I'm so excited to have a friend working there, because she gets free samples up the wahzoo. If you're in the DC/metropolitan area, go ahead and try Sweetbites Desserts. You will not be disappointed, I promise. There's my gal looking sweet! Follow Sweetbites on Twitter to see where they'll be next! What a sweet post! I'm so happy that you were able to share these with us...I've been to DC several times, and the next time I'm there, I'm going to track sweetbites down! The red velvet looked heavenly, but then again...they all did! Thank you for sharing. We all need some sweetness in our day. mmm delicious cupcakes and adorable plates! 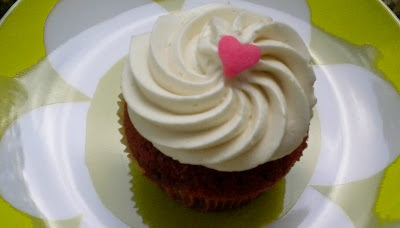 ::sigh:: I wish I liked cupcakes and sweet stuff more. This looks so good, but it just doesn't appeal. Now find me someone who makes 50 varieties of gourmet potato chips and I'm there!